Galloping Horse Treading on a Flying Swallow (mǎ tà fēi yàn 马踏飞燕 /mǎ chāo lóng què 马超龙雀), or Bronze Galloping Horse, is a bronze artwork of the Eastern Han (dōng hàn 东汉) Dynasty. It is now preserved in the Gansu Provincial Museum. This horse statue, a representative of late bronze artworks, was unearthed in the Leitai Tomb (léi tái mù 雷台墓) of the Eastern Han Dynasty in Gansu (gān sù 甘肃) Province in the west of China. With a height of 34.5 centimeters and a length of 45 centimeters, the horse is raising its head, neighing and galloping forward with one hoof treading on a flying swallow, symbolizing that its speed can surpass that of the swallow. That the static sculpture is full of dynamic power reflects the excellent expression force of bronze artwork of the Eastern Han Dynasty and the positioning of its four legs strictly conforms to that of a living horse with the barycenter (zhòng xīn 重心) on a little swallow manifest the high level of design and craftsmanship. The Bronze Galloping Horse is the apotheosis of aesthetics of ancient China. It incarnates the rich imagination and exquisite craftsmanship of ancient sculptors and is the representative work of the time-honored cultural tradition and the oriental aesthetic art. 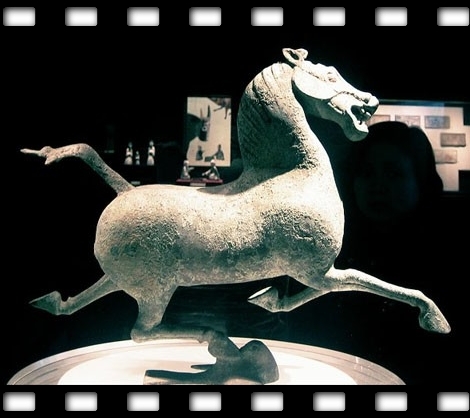 Bronze Galloping Horse is believed to represent the "spectacular steed" of Chinese culture. The statue is of high craftsmanship and fully expressive of the horse-breeding culture of ancient China's western regions. The statue has become a symbol of Chinese tourism and a representative work that brings forth the time-honored cultural tradition of the Chinese nation and oriental aesthetics (dōng fāng měi xué 东方美学) to the world.